Hey!! Glad to be back after some time off - we hope everyone had an enjoyable Holiday Season!! Today I'm just going to keep it simple & to the point. I've been enjoying mixing some of my new Christmas items with trusty old pieces lately. It makes a perfect mix using a new piece to spice up an old one. Both of these dresses are Old Navy purchases from 2-4 years ago. I've said it before, & I'll say it again - Old Navy has some of the best dresses that you can buy off the rack...simple, easy to wear, & can be a great staple for a few years. I saw a couple of great dresses there the other day for just $20...can't beat that price. This one is very similar to the striped one from above, & this one is similar to the cobalt blue dress above. I've also listed a few others I'm swooning over in the Shop the Post section below - some are as little as $12-$17!! Eek! As you can see, it was a chilly day when I wore this outfit. 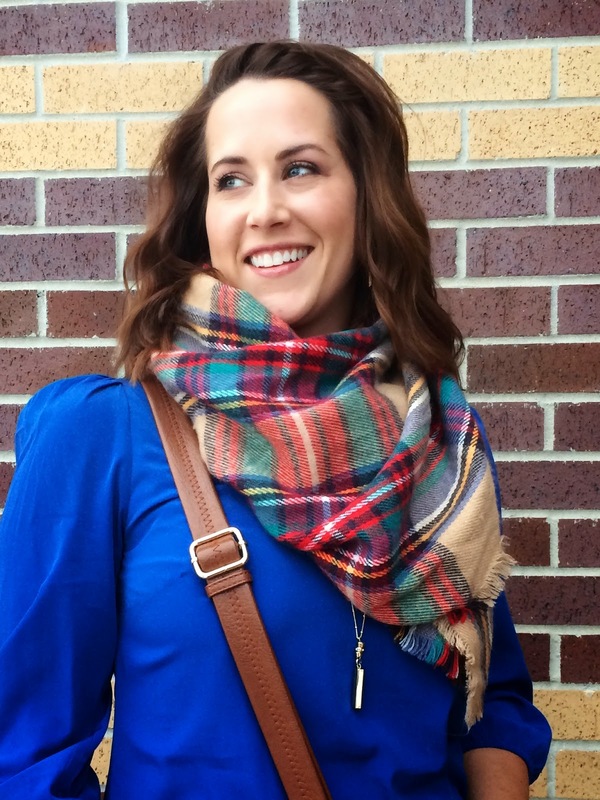 Choosing to belt the blanket scarf was an excellent way of adding warmth & coziness! I'm also a huge fan of pattern mixing, so the stripes, plaid & leopard all make for an outfit full of interest. No joke, I've had this cobalt dress for at least 4 years & I loved being able to wear it with the plaid scarf & 50 shades of Cognac (lol). The bright cobalt brings some brightness to chilly winter days. The jacket I wore with this is the (Minus The) Leather Quilted Sleeve Jacket from Express - a Christmas gift from my mom. I'm excited to continue to pair this great jacket with many things in the future! 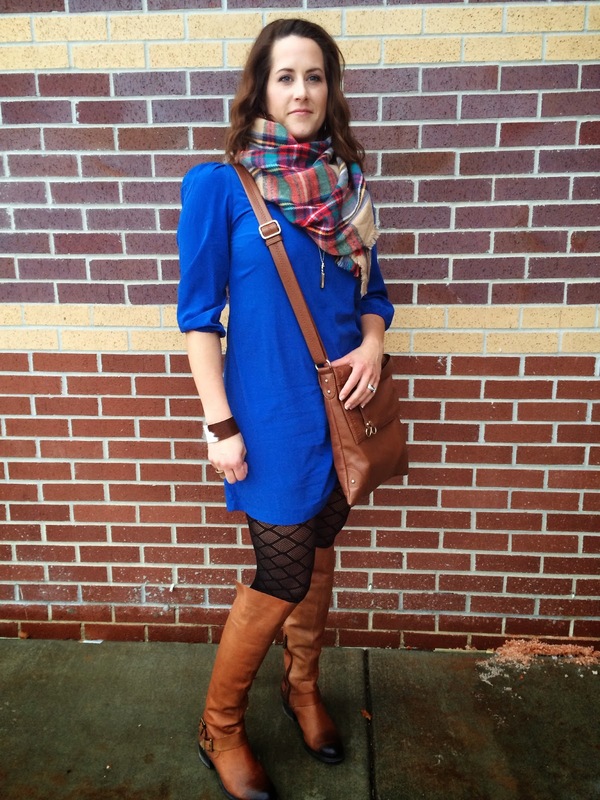 Great styling with that pretty scarf! I am also into closet shopping in my latest post - hope you could check it out & lemme know what you think! 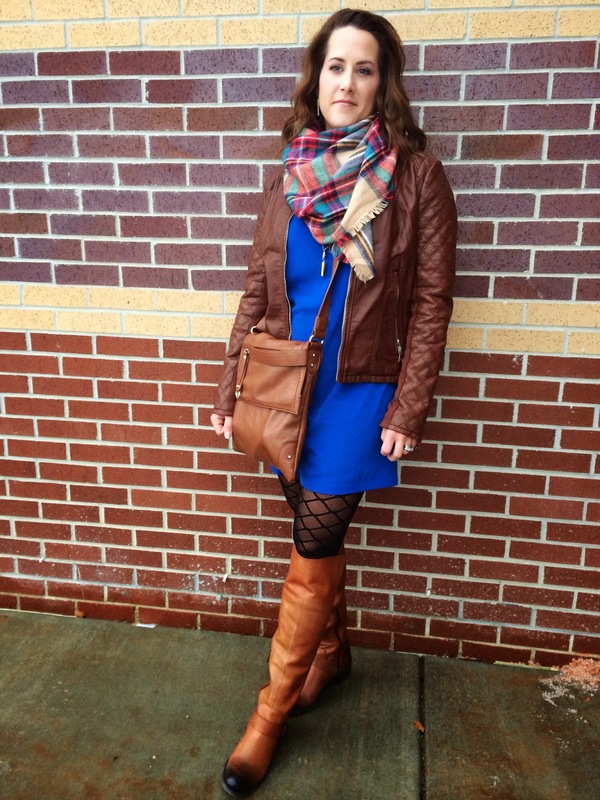 Love seeing how you restyled your scarf in two different ways. Although I have worn mine a ton, I haven't gotten very creative with how I wear it. You look great in a dress! I am sooo with you--love Old Navy's dresses so much :) Love how you styled these scarves too-- I am always boring and tie them the same old way--will def be keeping how you did it in mind to try for the future!! Happy New Year and glad you are back! 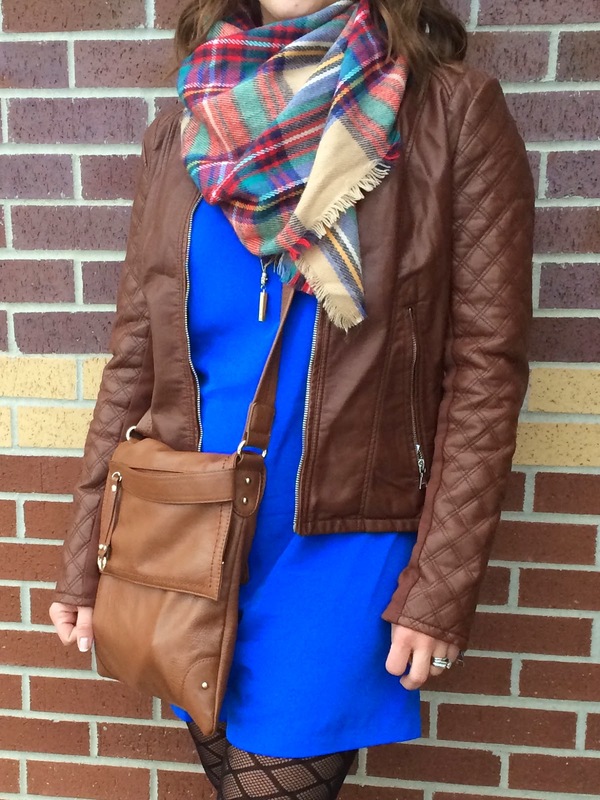 That's an amazing cobalt dress and you styled that look to perfection Kellie!! I love everything about it. Old Navy dresses do rock! I love my MTL jackes from Express. It is surprising warm too. I love the last picture with your pretty smile. I am glad you took some time off from blogging to enjoy life. You came back rocking in style. 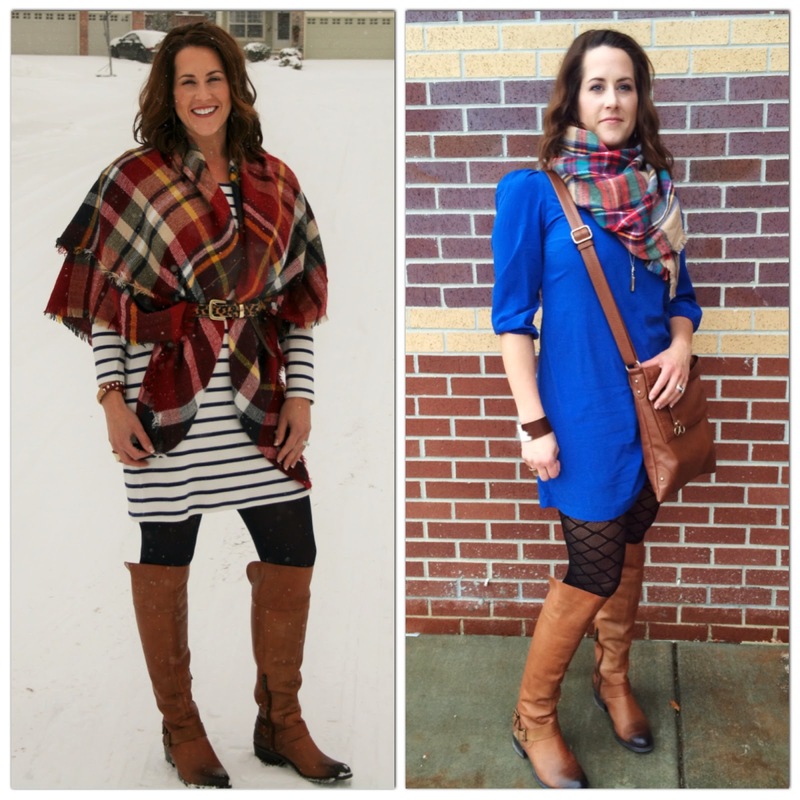 I love both ways you styled your plaid scarves and pinned these outfits. I also liked Carylee's version of the striped dress look! Well done Kellie. Happy 2015 to you, pretty mamma! Enter the $225 Nordstrom Giveaway HERE! Old Navy has been killing it lately with their offerings. I love the 2nd outfit and may be partial since I have a similar scarf and will need to pair it with cobalt blue - it looks great!